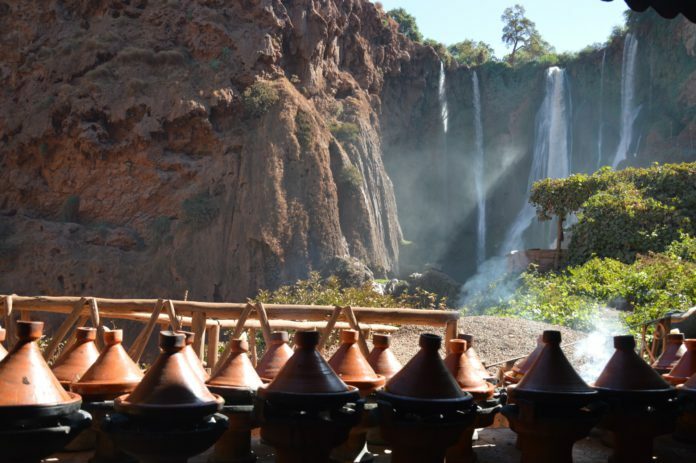 In Ceramic tagines in one of the restaurants in Cascades d'Ouzoud waterfall valley, a freshly prepared traditional Moroccan dishes are luring you by its aroma. 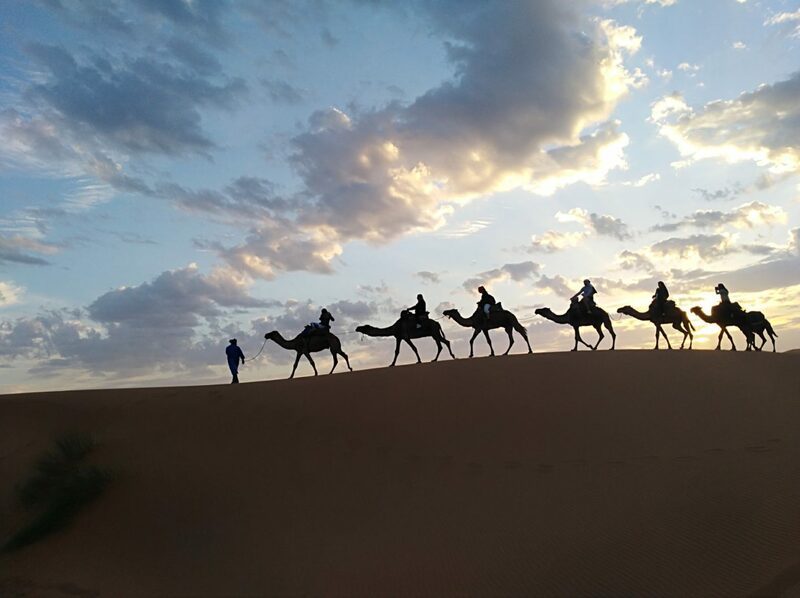 “You won´t see Rabat, Casablanca, or Tanger, but you will experience desert flees, taste fresh camel milk, stay at the Berbers, and perhaps touch heaven when we ascend to more than four thousand Jebel Toubkal.” Admit it! I couldn´t resist this Moroccan temptation. The beginning of the trip was like an oriental movie. You just can´t read about the famous city of Marrakech, you have to experience it. 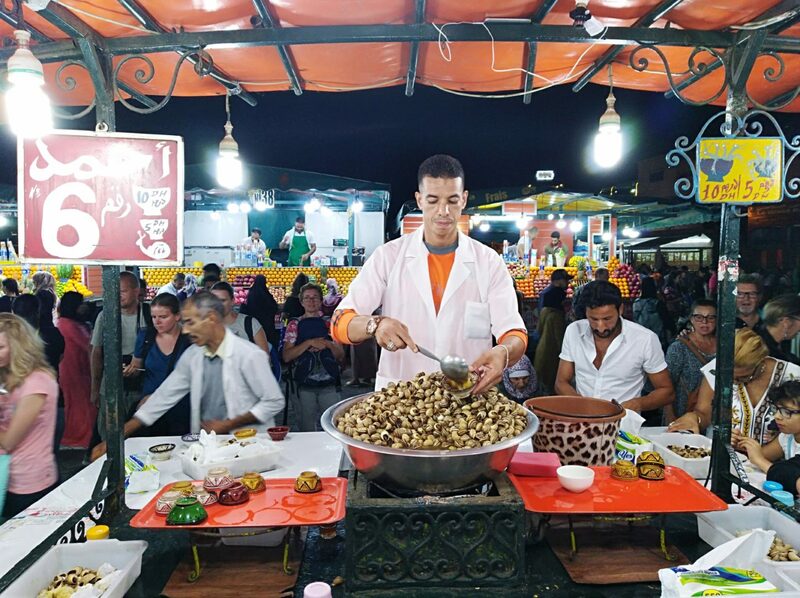 The best is in the evening when Djemaa el-Fna’s central square becomes a kind of open-air theater – tempting meals, different music at every corner, acrobats, jugglers, serpent tamers, some of them can even anchor on your neck, calligraphers, lantern vendors… We bet on our stomachs. I was lucky to taste a snail soup. Actually, it was a blind offer from our tour guide: Who feels like something extraordinary? A bowl full of striped shells landed in front of me. Mosaic look – and great taste. I haven’t even closed my eyes. The fact that we have such snails in the garden at Kopanice didn’t play a role. Those from Marrakesh were just yummy. What about inspiration for Sunday lunch? Throw away the prejudices: the snails tasted great. And definitely ask for enough broth. Moroccan dishes combine typical Berberism with a nonchalant -French, natural Spanish, and spice-like Arab influence. Nothing too hot, all exceptionally well aromatic. Mainly thanks to the unbeatable spice called cumin. You should definitely try the most typical stuff the country offers. Tajine (tagine) – a few hours on the charcoal in a special clay pot (also called a tajine, stew with potatoes, couscous with seven vegetable species, skewers from different kinds of meat marinated in herbs, fermented camel meat covered with olive oil, a thick chickpea soup of the hariru, which you can get everywhere for a change, a bean thick soup lubia or seasoned lentils, or fresh raib yogurt, which “corrects” your intestine microflora, a soup similar to tripe soup, merguez beef or lamb sausages, huge sweet dates, slightly prickly pear with a daily dose of vitamin C, and more excellent lures. Three weeks of vacation aren’t enough. The cherry on the top was a chicken grilled on pickled lemons. Tagine is a Moroccan pride. 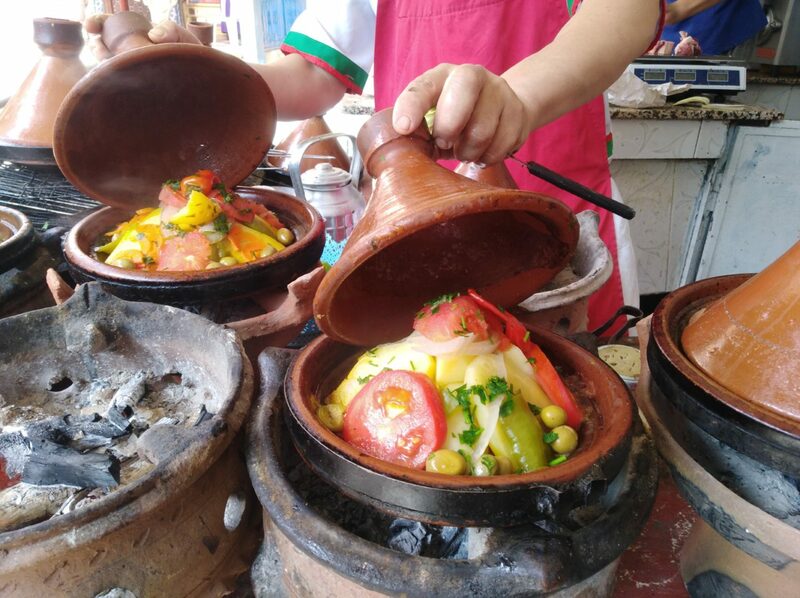 Several hours on charcoal stewed pieces of meat layered with potatoes and vegetable garnish in a ceramic pot have belonged to the typical gourmet specialties of the country for years. You will definitely remember the Marroccan – chobz at home. Most of the time it’s a flatbread. The locals eat it with everything, and after a few days, we weren’t an exception. Despite the fact you can get it almost everywhere, most of the Moroccan women prepare the dough by themselves. Baking at home is rare, the busy bakeries are at every corner. You can often see children with baking tins are loaded with the dough heading to the bakeries. There are several types prepared in Morrocco; little white bread batboutom or msemmen – bread like pancakes are very popular and typically covered with various types of spreads. 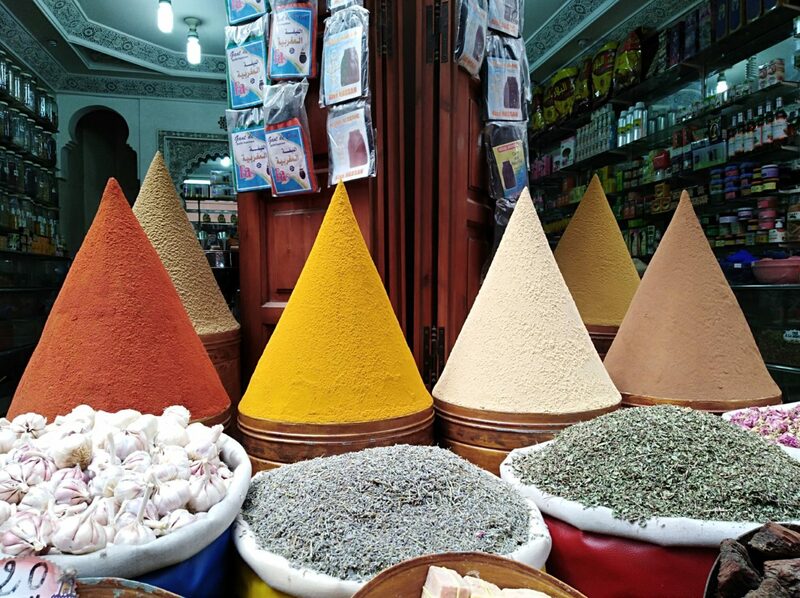 In unbelievable shapes, the vendors form the most versatile and aromatic spices. Have you ever sat on a camel? Of course, it isn’t a problem. In Egypt, Tunisia and other tourist destinations, you can sit on the tamed camel, you will be taken some pictures and pass a few meters… But going in the saddle of this desert cruise on a long trip couldn’t be quite comfortable for everyone. And that’s not the goal. On the contrary, the goal is to experience the infinite distance, silence, huge desert dunes and enjoy an oasis far from civilization. Does it matter that you are all aching from the saddle, you will have small blisters from holding tight onto an unergonomic harness, that you grumble about the fine sand which gets almost everywhere and that the camel right behind you will spray, make you wet or lick you from top to bottom? Even so, in the oasis, you will give it a warm pet on the curly head out of gratitude that the way there is already behind you. And in the morning, in the dark, you will find it again, and you will come together to meet the real sunrise. It’s really stunning here in Sahara. Before that, you will have an excellent Berberian dinner, dream about glass of wine (we are in the Muslim country, you can really dream about alcohol if you haven’t brought a proper supply from home) and you find a home woven carpet that you can place directly under the stars, because it is abnormally hot in the tents. And do not forget to leave your socks on so that you don’t become a victim of treacherous and invisible desert fleas or the disgusting solifuges. I was really looking forward to the fabulous Fez, with the legend of the last living medieval city. It originated in the 9th century, and with the semi-open eyes and a little bit of fantasy, its medina hasn’t changed at all. The unique, narrowing aisles full of shops, restaurants, cafes, but also with sewers directly on the sidewalk and donkeys carrying an unimaginable cargo… However, we were attracted by tanneries and typical tan houses. The view from the terraces of the surrounding houses to a huge yard full of huge tanks, where muscular men manually processed the skins of diverse animals, was like in a Gladiator movie. 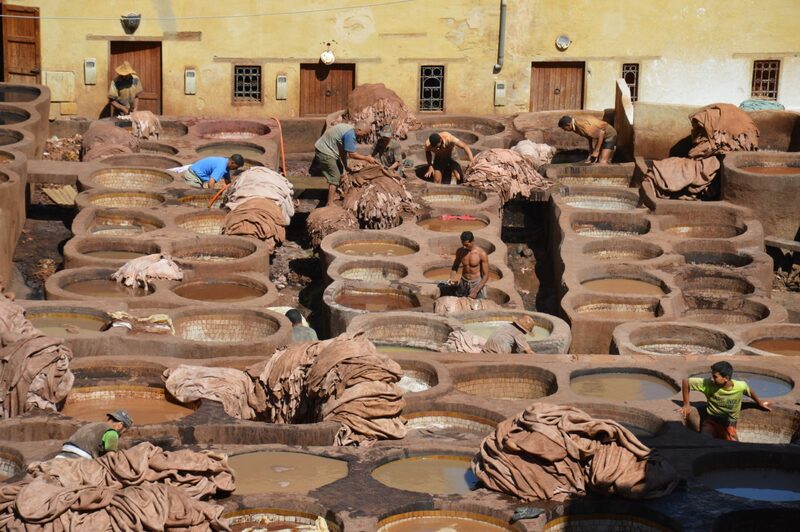 Backbreaking manual work, all day long dipped in the water up to the knees, breathless furnace fumes of skin processing, burning sun – together with the lowest wage in all of Morocco. I felt like in times of slavery. On the way back through the covered streets of the bazaar, I no longer wanted to see the beautiful leather handbags… Behind I have witnessed the inhumane conditions of their production. A view at the tanners’ hard work looks almost as from the first civilizations. Cascades d’Ouzoud (Olive waterfalls) fall from a height of about 100 meters into natural lakes, where tourists are waiting for the so-called “Berber Titanic” – boats decorated with flowers. You can reach them by stairs with multiple observation points along with typical tea shops and small stores with fragrant spices, herbs, oils and the like. You won’t definitely stay dry – falling water is dispersed in small droplets throughout the “waterfall cauldron,” and when a pleasant breeze rustles, there is no better refreshment. You will appreciate it especially on the way up on the endless stairs… Don’t be surprised if the domestic monkeys suddenly “pick” your bag or least sit on your shoulders. It’s one of the most visited locations in Morocco, so hotels and apartments are growing in the area. We can only hope that the investors will be wise and won’t destroy the intimacy of the surrounding magnificent olive groves and charm yet virgin remote mountain villages. Early in the morning just before the sunrise, the sun offered such a – almost a trashy – view of the camel caravan.